I’ve always been great at moving through big crowds, but not so great at tolerating them. Especially the people who just move aimlessly without noticing that they’re blocking traffic. However, strangely enough, when I found myself competing with cows, cars, motorcycles and other people to cross the street, I found it more of an interesting challenge of what I’ve learned in my yoga practice than annoying. I found myself understanding the fundamental importance of vinyasa krama. What Does Vinyasa Krama Mean? So according to Desikachar, the phrase “vinyasa krama” refers to the meaning that it is not enough to simply take a step; that the step needs to take you in the right direction and be made in the right way. A perfect lesson for crossing a street in India. Yoga is all about creating mindfulness in our thoughts and action. However, the term “vinyasa krama” relates to not only the way we move on our mat, but in the outside world as well. Well, in India vinyasa krama is important at every moment – especially when crossing a street, or even walking in the street to avoid stepping in a puddle or a holy land mine left by one of the hundreds of wandering sacred cows or possibly goats, dogs, monkeys, and wild boars. Then there’s the sight of trash left by the humans, and the noise from the beeping horns, the smells of incense and spice from the surrounding street vendors, and the women with babies begging for food and money. It’s very distracting and can make anyone who is not familiar with these sights, sounds and smells very confused. Try meditating in the middle of that scene. Notice what happens when you are holding a balance pose and are suddenly distracted by a thought that has nothing to do with holding that pose. You probably fall, right? That’s because we’re so used to overstimulation from our everyday world, and focusing the mind is a difficult task. A distracted mind wants to think about everything BUT the breath, or the position of your hands, or holding mula bandha, and more likely wants to pay attention to the strangeness of the experience. What I think made my experience tolerable was that I just let go of the strangeness and confusion of the experience, embraced it for what it was: weird and smelly, and focused on my heading and everything moving around me. 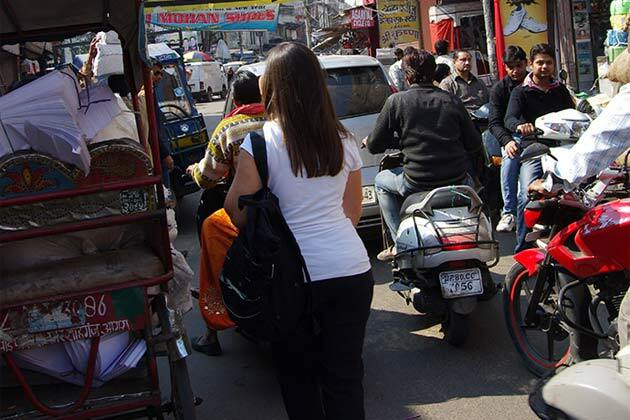 Walking in the streets of India was a practice of mindfulness and vinyasa krama to its fullest extent. Why Are These Cows Walking Around The City? Practicing yoga is like walking though a crowded street full of strange things, but being focused enough to move through it to get to where you want to go, and not let the overstimulation that is surrounding your mind affect the way you think, move or act. Of course it takes practice. 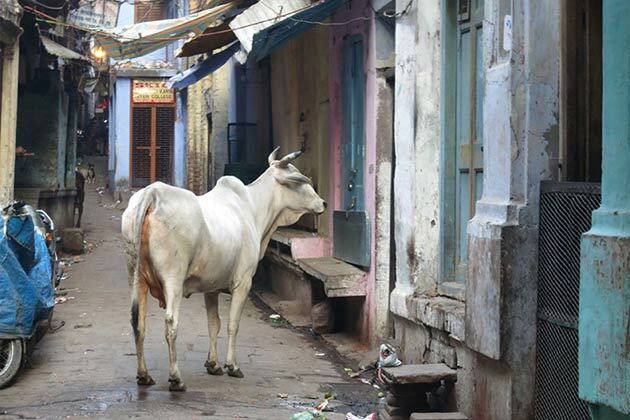 Cows on the streets of India know they can walk freely around any street during the day to find food and return home at night without harm. They know this is how they live and they’re used to it. Our own cows, or distractions, are the ones we create for ourselves in daily life to avoid silence and our thinking minds. Our “cows” come in the form of television, radio, e-mail or even Facebook. They’re walking around every corner and hard to avoid. Perhaps our own cows need to be released daily as well so we can focus on taking a step in the right direction, made in the right way, towards quieting our minds. Making vinyasa krama not just a practice of movement, but of the mind.